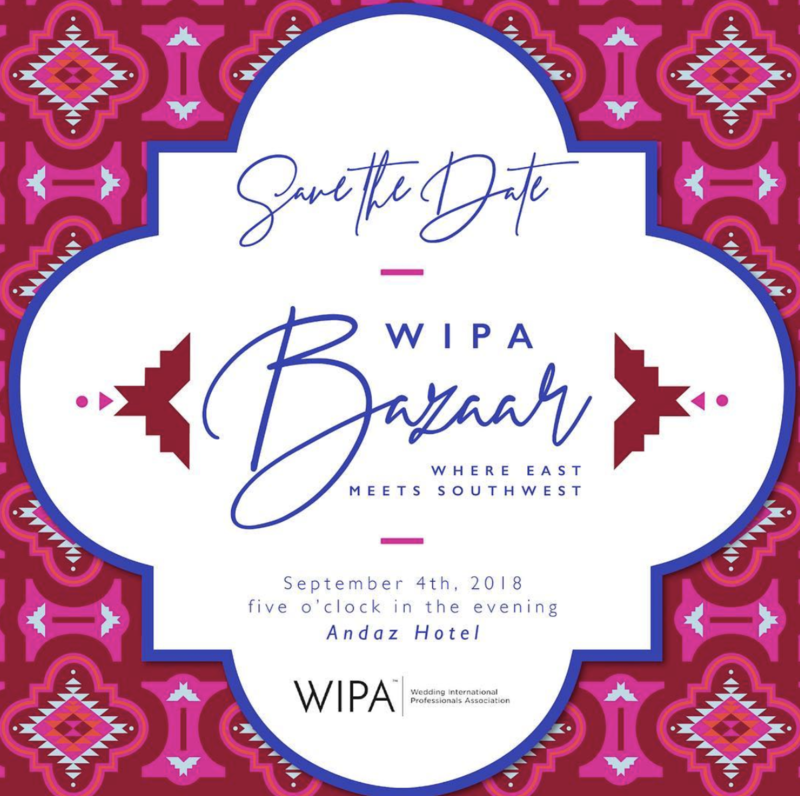 and are open to all WIPA members. 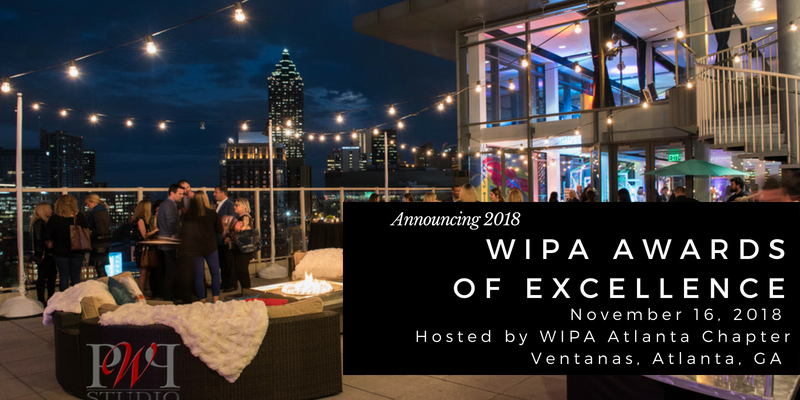 The Awards of Excellence Ceremony will be held at Ventanas, a private event facility that features dramatic floor-to-ceiling windows revealing a breathtaking view of Downtown and Midtown Atlanta. This extraordinary all-encompassing event venue is conveniently perched atop the fourteenth and fifteenth stories of the Park Pavilion building, which includes a 2,500 square foot outdoor patio, overlooking downtown Atlanta’s Centennial Park District. Ventanas offers approximately 10,000 inspiring square feet of premier indoor and outdoor rooftop space which is ideal for any corporate event or special occasion. 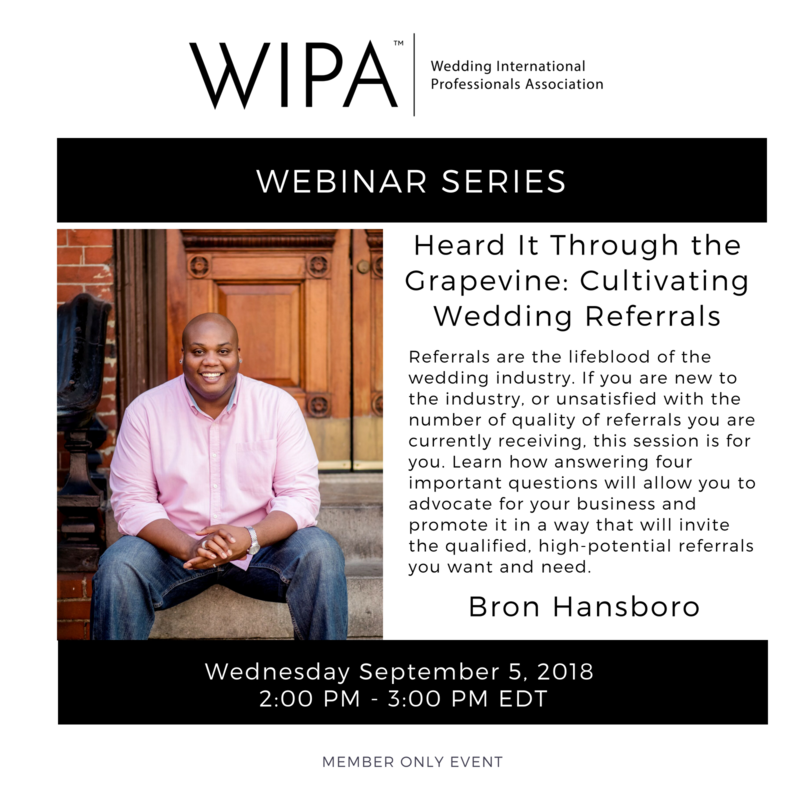 "I Heard It Through the Grapevine: Cultivating Wedding Referrals"
Referrals are the lifeblood of the wedding industry. If you are new to the industry, or unsatisfied with the number of quality of referrals you are currently receiving, this session is for you. Learn how answering four important questions will allow you to advocate for your business and promote it in a way that will invite the qualified, high-potential referrals you want and need. Flowers by Yona is a full-service floral and event design studio, based in Atlanta, Georgia and serving the Southeast region. and unique furnishings and other decor items. We specialize in using Flowers and Decor to truly tell a beautiful and cohesive story. Art & Emotion- photography and video for sophisticated couples. floor length linens, overlays in pillow in over 500 upscale fabric/color options. We are Los Angeles based premier event planning designer company. specialized in creative design and coordination of highWend events. We are Los Angeles Based premier event planning and design company. specialized in creative design and coordinating high-end events. Wedding and Event Production. Design, Planning, Coordination and Management. that you and your guests will never forget! We are a full scale catering and event company focusing on regional and seasonal offerings. Stein Eriksen was an innovator, a world champion, and an Olympian who forever revolutionized the alpine skiing world. Stein attracted world attention in the 1952 Olympic Games in Oslo, Norway, where he won the Gold Medal in the Men's Giant Slalom. Two years later, Stein captured three gold medals for Slalom, Giant Slalom, and Combined at the FIS World Championships. Stein's pursuit of the best has been infused over time into the Lodge and is exemplified in how staff and guests interact. Stein wanted to give his guests a memorable escape from everyday life; an opportunity to relax, enjoy the outdoors, and reconnect with nature. uphold the "Stein Way" standards that Stein Eriksen lived by everyday. For years, Snowmass has been one of Colorado's top destination wedding locations — and for good reason. The fresh air, scenic vistas and away-from-it-all solitude are undeniably romantic. With the addition of the new Limelight Hotel Snowmass to the scene, brides and grooms have even more options for ceremony and event space, as well as room blocks. Combine their space with the on-mountain venues — Lynn Britt Cabin or Elk Camp Restaurant — just a gondola ride away, and you have a magical wedding just waiting to happen. Scheduled to open Thanksgiving 2018! Chez Wedding Venue welcomes new Sales & Marketing Coordinator McKenna Miller. Hank Lane Music celebrated its 40th anniversary in August. Hank Lane Music announced the launch of a new website in August. Hank Lane’s Steve Delisi Band performed at a surprise 40th birthday party in North Carolina for NASCAR superstar Kurt Busch, August 7. Ryan Wagner, of Bespoke Edge, taught a class for the Custom Tailors & Designers Association in Chicago on August 7th. BE is a proud member of this organization. Echo Talent's Gold Standard has been the featured entertainment for Ernst & Young Entrepreneur of the Year Awards each year for the past decade. After performing for the Salt Lake and San Francisco EOY Awards, the band is again slated for next year’s events in both Utah and California. Gold Standard was also featured with Fuse Events in The Knot's 50 Weddings in 50 States. Active Production and Design celebrated 25 years of Audiovisual service by throwing an old school blacklight rave with their employees, clients and colleagues! Check out their blog post about the event here. Coastal Catering partnered with Wildflower Linens and the Fashion Island Hotel (as well many other wonderful Industry Professionals) to promote Wildflower's Newest Linen Line! We were thrilled to see so many familiar faces and new faces alike, as well hashave an opportunity treat everyone to some summer fun with some of our new interactive food stations! Creative Coverings has launched their brand new website, go take a look! They are also speaking at The ACCP National Conference on August 20th in Napa, CA about Setting the Tone for your event. Sound Investment AV was featured in Party Slate "Lighting that can Transform Any Event" for their production in The Enchanted Evening Party. HereComesTheGuide.com shared their fave spots for romantic wedding proposals with readers of SunsetMagazine.com, and also gaveCountryLiving.com some venue + style inspo for fun Halloween weddings. Plus industry insiders Sage Wedding Pros tapped Here Comes The Guide’s CEO, Meredith Monday Schwartz, for her advice on “How to Get Couples to Respond to Your Email Proposal. Emily Sullivan owner of Emily Sullivan Events presented at ILEA Napa-Sonoma on Tuesday, August 7 discussing client boundaries. She was also featured on Ruffled with her article on how to incorporate local flair into a wedding. Heather Jones, Catering Sales Director of Wente Vineyards was recently shared her wedding day menu trends with Martha Stewart Weddings. She was also featured on SheFinds discussing wedding trends that are officially out for 2019. Kevin Dennis of WeddingIQ spoke with Bustle on ways to survive summer wedding season without going broke. He also recently wrote a guest article on WeddingWire EDU where he discussed networking etiquette for the conference season. It's also been announced that he will be speaking at The Special Event 2019 in San Diego, CA on January 8-10, 2019, presenting Lighting and Decor Transformations as well as serving as a panelist for a talk on 21st Century Customer Service in the Event Industry. Meghan Ely of OFD Consulting will be wrapping up her WeddingWire World season with her "Surprise & Delight" talk in Dallas on October 15. 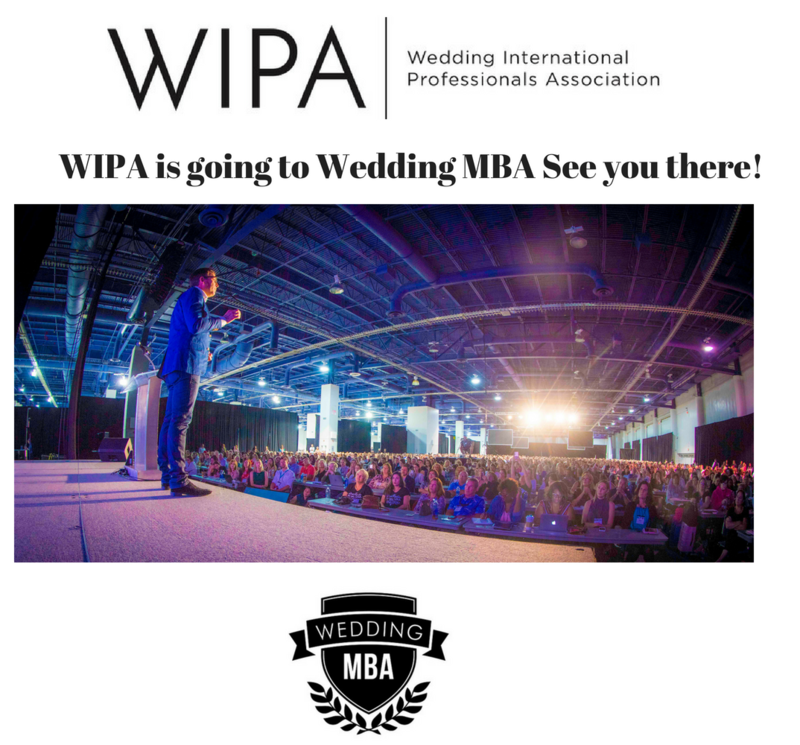 She'll then head to Wedding MBA in Las Vegas in November, presenting Walking a Tightrope: Work-Life Balance. Sarkis Studios was featured in Inside Weddings with Nahid Global Events, BBJ Linens, Bright Event Rentals, Enticing Tables, NEffect Productions, Shannon Weddings, Lovesome Blossoms, Sobelle Favors, Sensational Treats, BreLuxe, Trish Peng, for the WIPA Design Challenge at AV Irvine. Angelica McDonnell of Green Orchid Events has recently rebranded the company to Angelica Rose Events. They are excited to continue to plan and design weddings under their new company name! Magnolia has a reason to celebrate! They recently re-branded and launched their new website. They were also featured in Modern Luxury Magazine. Greatime DJ celebrated 20 years in business. Luxe Linen was featured on Belle the Magazine for Moody Glamorous Wedding. Strictly Weddings also featured Luxe Linen for Luxury Ritz Carlton Wedding Fit for a Royal and the Bridal Shower Tea Party from Luxe Launch 2018. A Romantic Blush Franciscan Gardens Wedding highlighted Luxe Linen on Every Last Detail. Focus on the Coast Weddings featured a Lemon Luncheon bridal shower styled shoot. While a second styled shoot, Glamorous Wedding Inspiration, was featured on Southern California Bride. Premiere Party Rents is featured on Junebug Weddings for this Chic Chapel Wedding. Premiere Party Rents is featured on Strictly Weddings for this Luxe Launch table design. Good Gracious! Events is featured on Kara's Party Ideas for XO Bloom's "Blooming Into Summer" dinner. Good Gracious! Events was also a sponsor of the Casa Vertigo LA re-launch. On August 1st, Carondelet House hosted WIPA's SoCal Members Only Meeting "Wine Not?" for an evening of wisdom and wine. The menu was paired the delicious Ancient Peaks Wines with the exquisite catering of Tres LA. Education provided by The Knot's Real Weddings Editor, Becky Murray. Becky covers the realistic celebrations and the pros who bring them to life.